Tappan Zee Constructors (TZC) is scheduled to continue roadway improvements near the Governor Mario M. Cuomo Bridge. The work requires single-lane closures on the Rockland-bound New York State Thruway (I-87/I-287). Specific lane closure times are listed in the chart below. TZC continues to remove material from the Hudson River following the controlled demolition of the old Tappan Zee Bridge’s east anchor span, weather permitting. The project’s largest crane, dubbed I Lift NY, has been relocated to the east anchor span site to assist with operations. TZC will continue to install rebar, pour concrete and strip forms on the northern side of the westbound span for the bridge’s shared-use bicycle/pedestrian path, barrier and overlooks. At the Westchester Landing, foundation construction continues on the terminus site walls. Operations include forming retaining walls, rebar installation and pouring concrete. 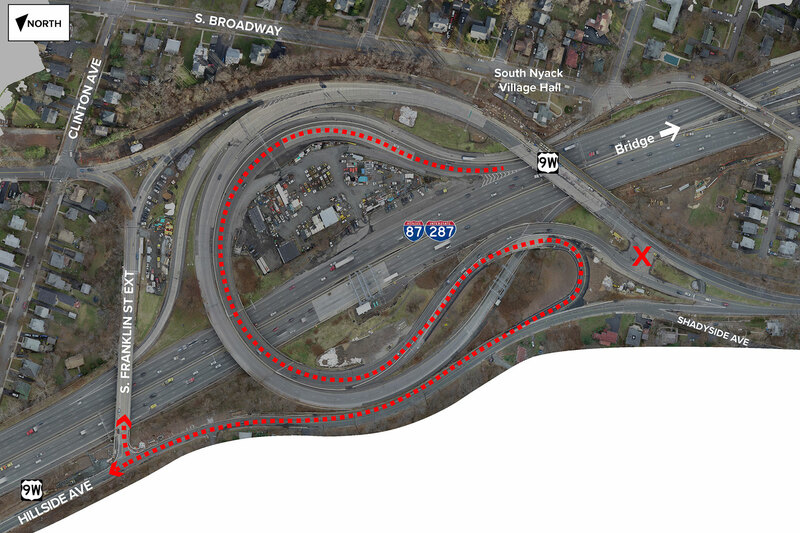 At the Rockland Landing, a new traffic pattern will soon be in place for motorists exiting the New York State Thruway (I-87/I-287) at exit 10 (South Nyack). Local traffic to the Nyacks will use a new ramp connecting to Hillside Avenue/Route 9W northbound. Currently, motorists make a U-turn within the interchange to head into the Nyacks and points north. The new ramp will allow motorists to directly access Route 9W northbound. Those seeking to access local streets will still be able to do so by using the Franklin Street Extension. The existing U-turn will be closed when the new ramp goes into service (see graphic below). Additionally, a section of the Esposito Trail from Clinton Avenue and South Franklin Street to South Nyack Village Hall remains closed for the construction of the side path. Pedestrians and cyclists are being detoured to South Broadway and through Elizabeth Place Park. Crews will continue construction of a retaining wall along Hillside Avenue, necessitating temporary lane closures. Flag persons will keep traffic moving by alternating the directional flow between east and west. Crews also are drilling and installing piles at Elizabeth Place Park for construction of a highway noise barrier. TZC will also mobilize equipment near Piermont Avenue in preparation for the placement of a precast structure next week, weather permitting. The structure will connect the bridge’s bicycle/pedestrian path to the Rockland landing. The western 300 feet of the 600-foot wide main navigation channel is closed to all vessel transits Monday through Saturday from 7 a.m. to 5 p.m. Periodic closures of the main navigation channel are anticipated to continue during the demolition period, as TZC continues to dismantle the Tappan Zee Bridge’s west anchor span and salvage the collapsed east anchor span. Cranes, barges and other equipment will occupy parts of the channel during this time. Boaters are strongly encouraged to avoid the project site during the closures and to avoid the Regulated Navigation Areas, located east and west of the main channel. Times and dates of the closures are subject to change and will appear in the U.S. Coast Guard’s weekly Notice to Mariners; on the project’s Twitter feed (@NewNYBridge); and broadcast on Marine Radio Channel 22A. Tappan Zee Constructors can be contacted via Marine Radio Channel 16 for assistance. Rockland and Westchester marine units continue to patrol the project site. More boater safety information, including the U.S. Coast Guard Notice to Mariners, a construction site map and GPS-tracked construction vessel locations, can be found at NewNYBridge.com/Boater. The New York State Thruway Authority provides this information as a public service. Any reliance you place on such information is therefore strictly at your own risk. Nothing in these guidelines shall supersede the actual construction conditions, and regulations set forth by the U.S. Coast Guard. All lane closures are subject to change due to traffic, weather or emergency situations. Please visit http://www.thruway.ny.gov/travelers/map/ for real-time information regarding traffic conditions.